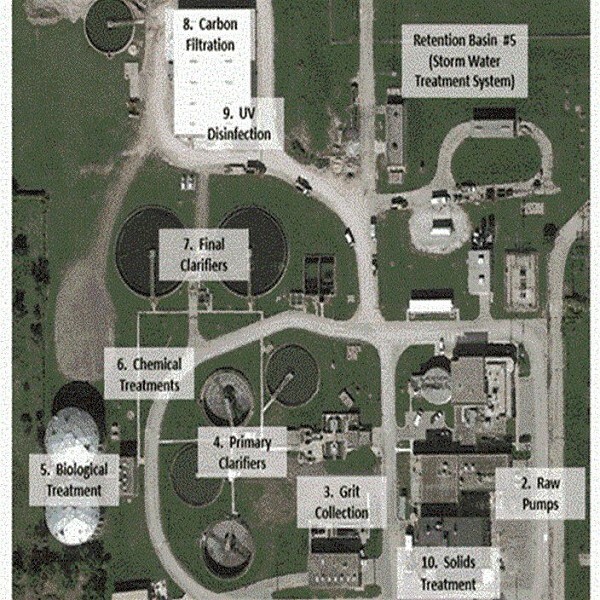 MyBayCity.com NO RAW SEWAGE: Bay City Wastewater Treatment Said "Best in Michigan"
Aerial view of Bay City Wastewater Treatment Plant with process labels. NO RAW SEWAGE: Bay City Wastewater Treatment Said "Best in Michigan"
The Saginaw River, contrary to some opinions, is cleaner than in the past century, says Laura Ogar, director of Bay County Environmental Affairs and Community Development. "The Bay County Water Treatment Plant takes in fresh water from the northern bay and polishes it up to provide exceptional quality drinking water," said Ms. Ogar. "I am thankful for this every morning when I make coffee and my tap water doesn't stink anymore. "Both the U.S. EPA and the state DEQ have significant regulations to prevent that from happening and to make discharges of raw sewage into the Saginaw River (or any water body) illegal." "The Saginaw River is cleaner today than it has been in probably the past 100 years, before the logs, industrial debris and raw sewage really did go straight into the river. To think nothing has changed is just simply laughable. "As Director of Bay County Environmental Affairs and Community Development, it's important that I try and correct misinformation and remind people of the restoration work and investment that's been made by so many someone's who have worked so long and hard to improve our community. Confirmation of that is the fact that sturgeon, who avoid dirty water, have recently been caught in the Saginaw River. Also, mink have been spotted here after at least a half century; the furry creatures finding more pristine surroundings to their liking again. Carol Injasoulian, Laboratory Manager at the Bay City Wastewater Treatment Plant, replied to reports about "raw or partially treated sewage" reaching the Saginaw River through our treatment processes. 'Last week our Retention Treatment Basin system performed perfectly. We captured approximately 38 million gallons of rainwater and that rainwater was polished through our carbon filtration beds here at the plant prior to being discharged to the Saginaw River. Regarding media charges "our Retention Treatment Basin System is having a negative impact on the Saginaw River, in our defense we are permitted by the state to discharge this treated water into the Saginaw River, our Retention Treatment Basins are designed to allow for solids settling and human pathogens are removed through the use of chlorine prior to discharge. "The final product meets our permit requirements, and has been tested and determined to be of a higher quality than straight stormwater runoff." Thanks for the correction Dave. Tell OJ to correct his story.